A Hodson Bay slimmer who lost three and a half stone has been named ‘Woman of the Year 2018’ in her local Slimming World group due to her inspiring weight loss. Orlagh joined Slimming World in January after becoming increasingly unhappy with her size. She said, “I started to put on weight after having my girls. The girls are 19, 16 and 12 now, so it wasn’t an excuse any longer! I tried lots of different diets, but they usually left me feeling hungry or miserable – or both, in fact. The mum of three followed Slimming World’s food optimising eating plan, which encourages slimmers to fill up on satisfying yet healthy everyday foods like fruit and vegetables, lean meat and fish, pasta, potatoes, rice, pulses and more without having to weigh or measure. “I know a lot of people worry about joining a slimming club because they don’t know what to expect. They needn’t be afraid though. 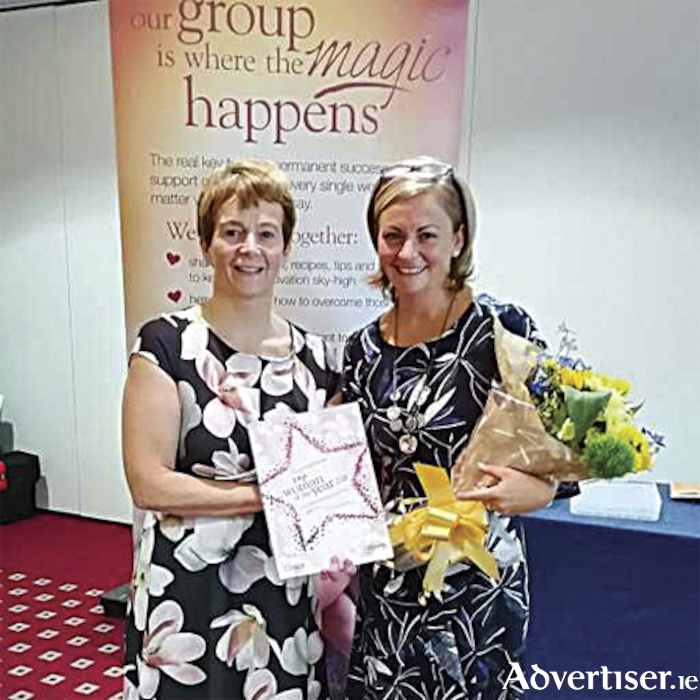 Right from the first moment I walked into my Slimming World group I felt at home, and the support and motivation I’ve received from my consultant Carol and the rest of the group has been brilliant. “Losing the weight has made such a huge difference – it’s changed my life. I’ve got so much more energy and I can do things now that I couldn’t before. My fitness has improved and with the fabulous weather this summer we were able to do so many more things together as a family and I was delighted to have all the extra energy. I’m now back at Crime Fitness and I’m really enjoying it. I’m more confident and I like the slim, happy, positive person I see in the mirror. There are so many inspiring women (and men! ) in Carol’s Hodson Bay group and I was honoured to be voted the group’s Woman of the Year 2018,” Orlagh added. Carol, who runs the Hodson Bay group, says, “I’m so proud of Orlagh. Not only does she look fabulous, she’s improved her health and is bursting with energy. She’s a huge inspiration to everyone in our group and I hope she inspires other women and men in Athlone to change their lives in the same way. It can be hard to admit that you need to do something about your weight and to ask for help, but Orlagh shows just what’s possible when you do!,” Carol commented. Carol’s Slimming World group is held every Saturday in the Hodson Bay Hotel at 9.30. To join or find out more call Carol on 0866006866, or check us out on Facebook at Carol’s Slimming World Hodson Bay.